Skindinavia Makeup Finishing Spray is listed under About.com’s Tips for Long Lasting Makeup. Beauty High compiles a list of 11 tips for budge-proof makeup. Skindinavia Finishing Spray is added as the last, but most important, step in achieving long-wear makeup. Refinery 29 details ‘Products Every Working Woman Needs’ including Skindinavia Finishing Spray, because once you set your makeup with this spray you won’t have the need for touch-ups! These 5 beauty tips by The Huffington Post Style lists Skindinavia Finishing Spray as a necessity for warmer weather. Vogue highlights the facial mists movement and features the silicone-free Skindinavia Primer Spray. 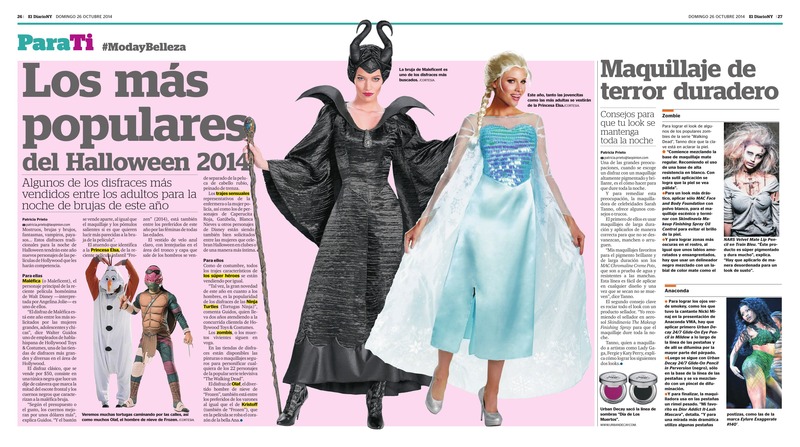 Pro Makeup Artist Sarah Tanno talks about easy ways to achieve Halloween looks using SKINDINAVIA Makeup Finish Spray Oil Control to prevent a shiny face in El Diario newspaper’s Fashion and Beauty section.